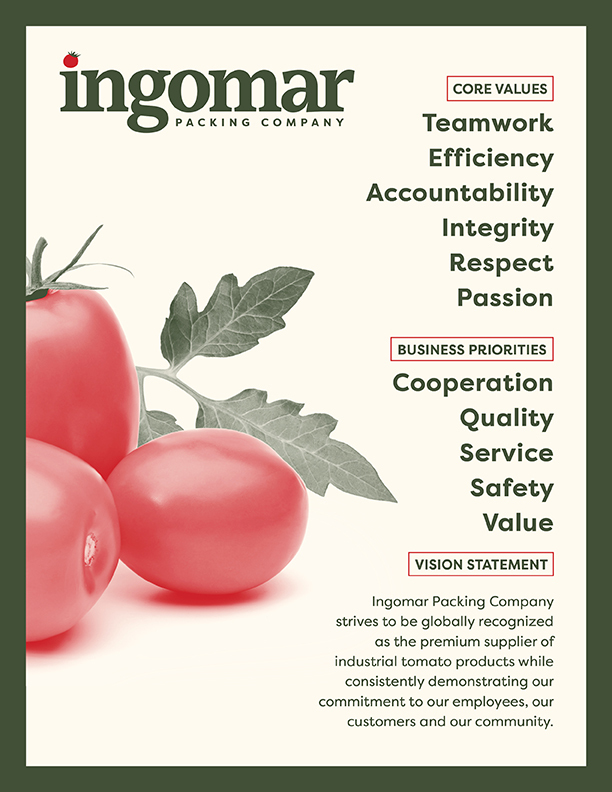 As the first strictly industrial processor of tomatoes in California, Ingomar Packing Company has set the standard for the highest-quality tomato paste and diced tomatoes in the industry. Since our inception in 1983, Ingomar has been driven by a single purpose: to focus all our resources and experience on growing, processing and packaging the most premium tomato paste and dice tomatoes in the world. We proudly further this mission today in our two processing facilities in Los Banos, California, right where we were founded. We are grower-owned, and our business model relies on local relationships. We work closely with our growers, who directly oversee the cultivation of the majority of the tomatoes we process in our facilities. Our close relationships with growers ensure our tomatoes are consistently of the highest quality – the absolute best for our customers. In addition to using only the highest quality raw fruit in our processing, our state-of-the-art equipment allows us the flexibility necessary to provide the wide array of finished goods, in regards to both hot and cold break tomato paste, that our loyal customer base requires. Additionally, our dedicated dice flume, coupled with the utilization of tomato varieties specific to dice products, ensure our customers receive the best quality in the industry. At Ingomar, we realize that the quality of our customers’ products is only as good as what we can offer. That’s why we have implemented a custom pack program in addition to our top-of-the-line equipment. We personally customize our packing process to respond to the individual needs of each customer, ensuring they not only get the highest-quality product but that it is perfectly suited to their requirements. We believe our loyal customers deserve this flexibility and attention to detail enough to let it shape how we operate. We not only customize packing but also organize our field management and process operations to meet customers’ unique needs. At Ingomar, our close ties to growers and customers are behind the quality of our product. Of course, our dedicated team of professionals is central to this process. In terms of our quality and food safety systems, we proudly maintain SQF Level 3 accreditation, having received a grade of “Excellent,” the highest possible score, during the most recent SQF audit. Ingomar Packing Company fully understands the stakes of environmental sustainability today. Since 2010, we have implemented changes in our fields and facilities to cut down on waste and pollutants. Our general recycling programs have nearly eliminated the need for contributing to landfills. Our solar panel array and the recent addition of more efficient processing equipment have decreased our carbon footprint. Our switch to more drip irrigation has conserved water, and the development of a wetlands area has not only minimized water waste but also contributed to a flourishing of wildlife. Our commitment to the environment will continue to be as strong as our commitment to our relationships and the quality of our product. We look forward to working with you as we strive to be the best tomato processor in the world.